According to David Rock, author of Your Brain at Work, there are two sides to expectations — there is what we expect from others and what we expect from ourselves. And apparently, the way that we manage our expectations can influence how we view our experiences and how we pursue goals. Mr. Rock, Director of the NeuroLeadership Institute, says there is a physiological reason we are disappointed when other random things do not meet our expectations. The neurotransmitter dopamine is released in our brain and makes us feel good when something positive happens. Take an event as mundane as anticipating the taste of the attractive dish your mother just made for dinner. We see the warm rice laced with veggies and cheese and there is a pleasant release of dopamine and a general feeling of well-being. 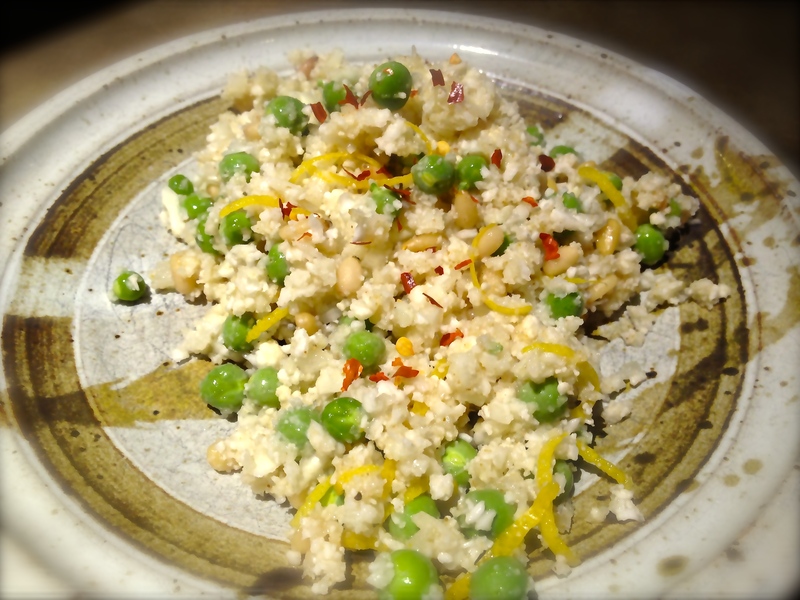 The flipside is that when our expectations are not met – such as the rice is really shredded cauliflower and the dish is cold rather than warm and the shredded cheese is actually lemon zest, the negative feelings are much stronger than the good feelings we get when expectations are exceeded. Complicate this with the fact that your mother should have explained this to you in advance setting your expectations and it turns out badly. In all fairness, had I set the expectations accordingly, our outcome may have had more dopamine but since I hadn’t, this one won’t be a repeat dish. It is a nice recipe and worthy of your table if you set it correctly. Cut the cauliflower florets from the stem. Pulse in food processor until it is the size of pieces of rice. Stir in peas and onion. Whisk together lemon juice, lemon zest, cumin, maple syrup, and ginger. Pour over cauliflower mixture and stir to combine. Top with pine nuts and chili flakes. Salt and pepper to taste. Do you share your expectations with others on a regular basis? It’s important in the office so that teams aren’t left hanging until the once a year leader meeting. It’s also important at home so that your children understand how they’re held accountable. Well, I did enjoy that dish, and it was exceptional. I adore cauliflower in place of many veggies, like rice or potatoes. The benefits remarkable , no carbs and the nutrients are huge. It’s amazing how rice-like it is. Love this article… the meaning of it. Setting expectations is so important. I do that at work without thinking about it, but somehow I’m not always good at setting all expectations up front with my daughter and husband. ..Or, maybe the stakes are higher to me at home. Anyway, it was a good reminder about setting expectations up front. Your photo of that dish totally fooled me too.. ha ha.. I wouldn’t have thought it was cauliflower with lemon zest on top. I too thought it was a warm dish. Your advice is priceless in setting up expectations for my family when I try making a new meal they have never had. Instead of hiding what they might not like, I should lay it out there beforehand. Yes, they will expect the worst (they always do, ha ha), yet they could find it to taste much better than they expected. My learning: How can I expect them to keep an open mind if I don’t set up their expectations to begin with. Thanks! I’ve had experiences on both sides, where I shared ingredients and then got a bad reaction but in this case, I think the reality was just so far from the perception that it threw everyone off. The dish is quite nice but not if you were expecting a warm cheesy comfort food! “OK, kids! I tried a new recipe!” The response? “What is it?” or more recently, “What is IN it?” LOL I did the same to my mother as well. I’ve learned to be up-front. Just give it a try, if you don’t like it, that’s OK. So in reality, I have adjusted my own expectations of how my kids will react to a new dish. Your recipe looks wonderful, and cauliflower is at it’s peak right now. Yum! Cauliflower season is one of my favorites! Fascinating post, Tammy. It’s a chilly day here, so the idea of cold raw cauliflower holds little appeal ~ I’m more in the mood for a warm bowl of potato and cauliflower soup. Having expectations for others is a recipe for disaster. Accepting the “what is” tends to lessen self-created suffering caused by a drop in dopamine. I adore cauliflower in any form. And I love soup even on the warmest day. Roasted cauliflower is my favorite! Hope you are having a picture taking, age faking, memory making, birthday caking kind of day!!! Yes Charlie, I think everyone thought it was a risotto! You know I made a garbanzo bean sauce for spaghetti for a dish called “spaghetti with garbanzo beans.” Everyone hated it. I waited a bit, then renamed it “garbetti.” Instant hit. Was so fun to see the explanation here! garbetti! I love it. This one will be back around next cauli season. I cooked all vegetarian last week (funnily enough, made a dish of spaghetti with garbanzos as mentioned above) and by Thursday, I thought my husband would drop his fork and head out downtown for a hamburger. He liked some of what I made at the beginning of the week but then he realized, maybe mid-week, that meat/fish wasn’t on the menu and started grumbling. (No idea what he’d do if I served up raw food, hmmmm.) I tried to make the changes without any fanfare, but I see now I should have managed the expectations. Thanks once again for a timely piece, Tammy. I’ve definitely had issues with what I expect differing from what happens. I’ve learned and I’m a little better about managing my own expectations but reading your post I realized I’m still not good at communicating my expectations to others. I tend to do all of the coping internally. Something to work on! Moms do the coping internally! I learn new lessons everyday and the kitchen is the proxy. My spouse calls it “managing expectations”, and it’s so true–the outcome differs based on what the expectations are. Since it’s still cold and snowed the other day here, a nice cool cauliflower dish would not be welcome here–but come August, it would be right up my alley as it looks lovely. Expectations are everything. In a job I once had, the mantra was to under promise and over deliver. It worked. Yes, despite the reaction that I received, I am sold on the idea of cauliflower rice. Yum! Tammy I just made cauliflower rice with cilantro and lime. It was so so so good! Your recipe looks delicious, too! favorite flavors! Bet yours turned out fantastic. 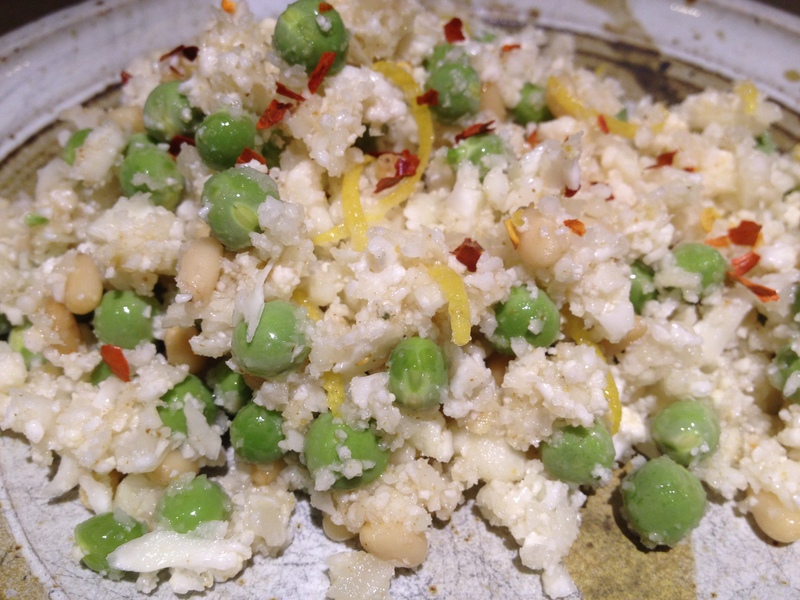 I have been amazed by the versatility of cauliflower–yours is yet another great preparation. I also like the idea of I Wilkerson’s “Garbetti”—that’s genius! will try it again in a warm savory dish!